ONEONTA - Donna Lee Bailey, 69, passed away on August 15, 2016, at Bassett Medical Center in Cooperstown. Donna was born on September 24, 1946, at the Mary Imogene Bassett Hospital in Cooperstown, a daughter of the late Maurice (Mike) and Cora Wikoff. A graduate of Cooperstown High School, she attended SUNY Cobleskill and graduated from the Culinary Arts Program at ONC BOCES. Donna was a member of the First Baptist Church of Cooperstown, and fondly remembered being part of the youth group that built the Youth Chapel. She also lovingly crocheted the nativity scene that for many years has been placed in the sanctuary during the Christmas Season. Over the years Donna worked at the Great American grocery store, the dietary department of Bassett Hospital and the Cooperstown General Store. 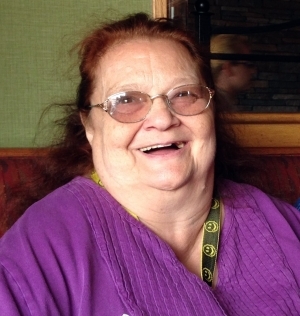 She loved working with people, and her boisterous laughter could be heard anywhere she was. Donna is survived by her daughters from her marriage in 1969 to Ronald Louis Bailey: Anna Mary Stone (Laura) of Cobleskill and Gretchen Rose Bailey of San Diego, California. Her pride and joy were her grandchildren: Cheyenne Katriana Bailey of San Diego, California, and Daniel Jaykob Bailey of Cobleskill. She is also survived by her siblings, Dawn of Las Vegas, Nevada, Terry (Paula) of Cooperstown, Mark (Delsia) of St. Louis, Missouri, Kim of Cooperstown, and Lori Anna of Las Vegas, Nevada. She also leaves behind special friends Bonny and Vera and her dog, Ginger. Donna was blessed to have nieces Chery, Tulsa, Hannah and Sarai, and nephews Joshua, Kyle, Joseph, Matthew, Micah and Shane, as well as many great nieces and nephews whom she adored. Donna's greatest joy in life was her family and friends, and while she was not often able to see them as much as she liked because of her state of health, she loved staying up-to-date and looking at pictures on Facebook. Every time she had a chance she was sewing or crocheting baby clothes, blankets and turtle rattles for each of the babies. Thank you to all of Donna's loving friends at Nader Towers, to all of our friends and family who have showered us with love, support and prayers, and to the nurses, staff and doctors at Bassett Medical Center, and at the Bassett Clinic at 125 Main in Oneonta. All of you made her last days on earth happy days. Donna did not want a funeral, so we will be having a celebration of her life that will take place from 2-4 p.m. Sunday, August 21, 2016 at Nader Towers, 2 Mitchell Street, Oneonta. Please dress casually, and do not wear black-she hated black! Donations can be given in Donna's memory to the First Baptist Church of Cooperstown, 19 Elm Street, Cooperstown, NY 13326, or the Nader Towers Resident's Organization.